Part 1 of the weekend's field testing of the Canon EF 200-400mm f/4 L IS USM Extender 1.4x involved a village cricket match. There are other interesting things happening in fields around Maidenhead during the summer though, so on Sunday it was off to the sheepdog trials at Hambleden, part of the annual Henley Show. My specific goals were to investigate some aspects of the lens which weren't really issues at the cricket match: the ergonomics of the lens on a monopod; how it handles in situations where you want to zoom frequently and rapidly; and the AF speed on moving targets. Here is an overview of the course from the spectators' viewing area. It's HUGE - about 400m long (left to right in the photo) and 250m wide. 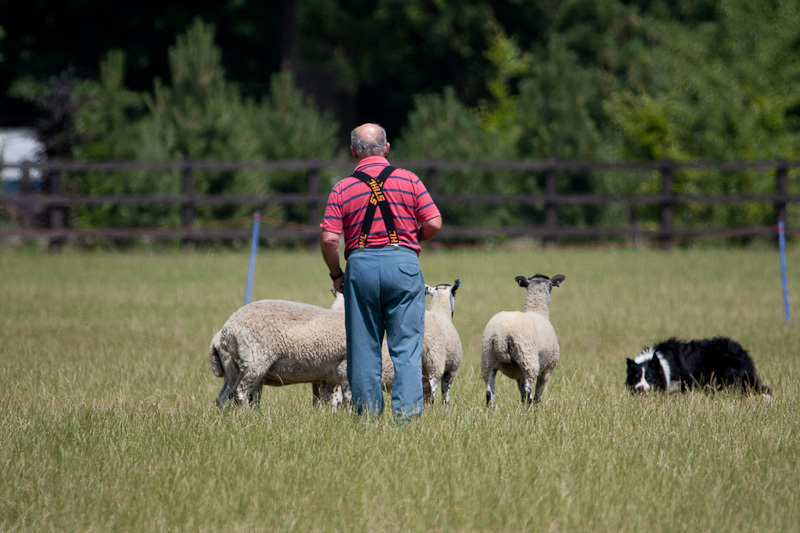 Much bigger than the fields used for any ball sports, even polo. 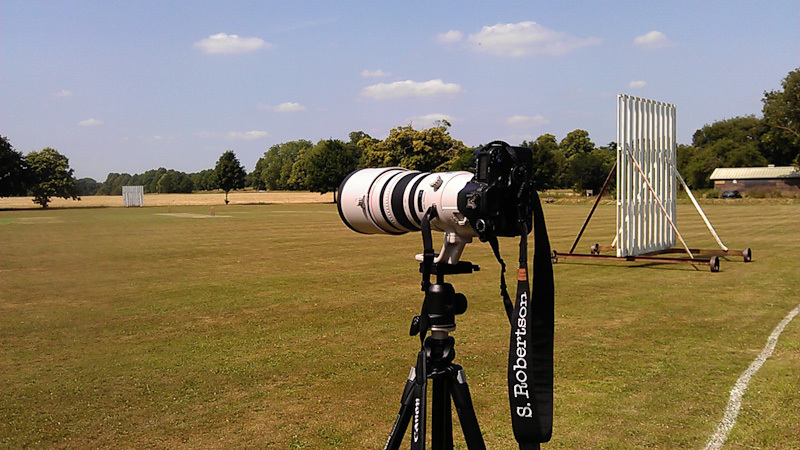 Clearly the action at the far end of the field is going to require a very long lens indeed. For those who haven't seen "One Man And His Dog" on TV, here's a quick overview of what happens. The shepherd stands at his station on the right. 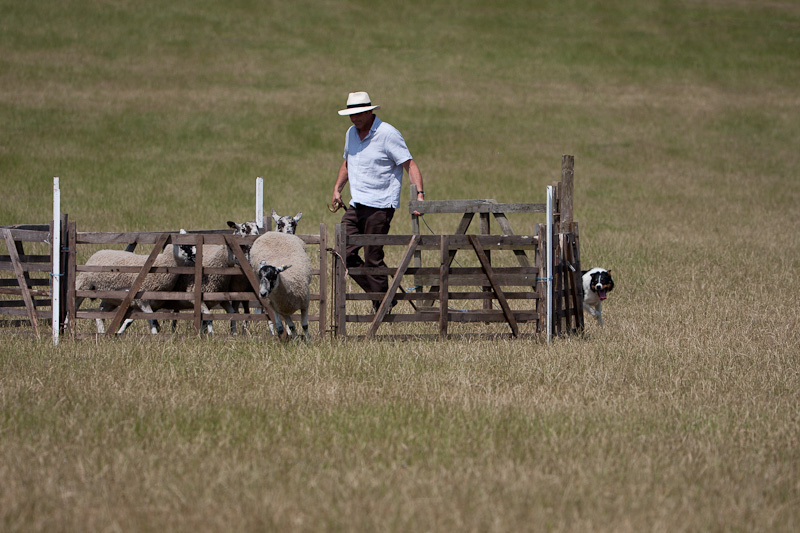 The dog runs from there down the far side of the course ("the outrun") and sneaks up behind the sheep on the left, aiming to get them moving ("the lift") with the minimum of fuss. 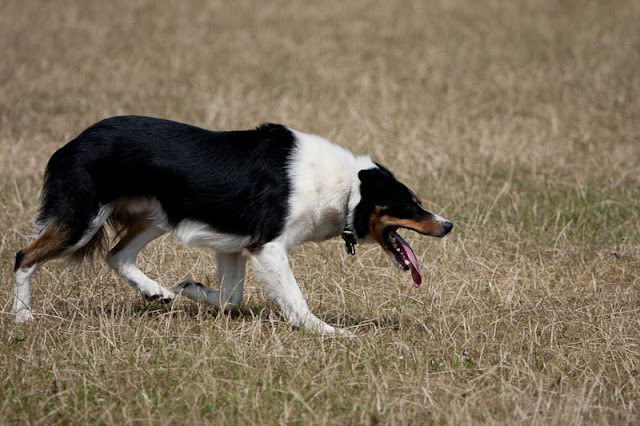 The dog brings the sheep back to the shepherd ("the fetch"), ideally in a straight line, passing through the pair of gates on the way. 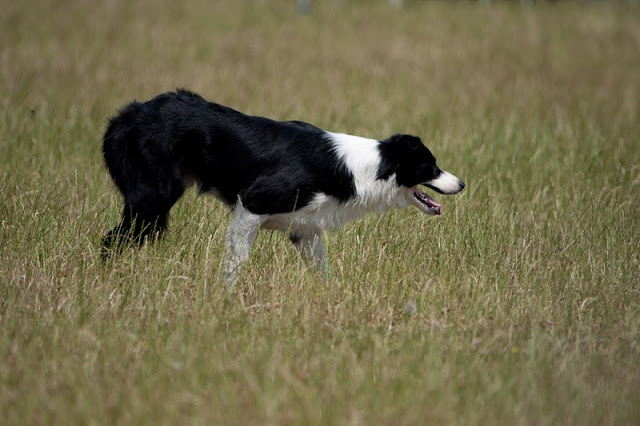 The dog then rounds the shepherd and takes the sheep out to one side of the course, across the course through two more sets of gates ("the drive"), and back to the shepherd. 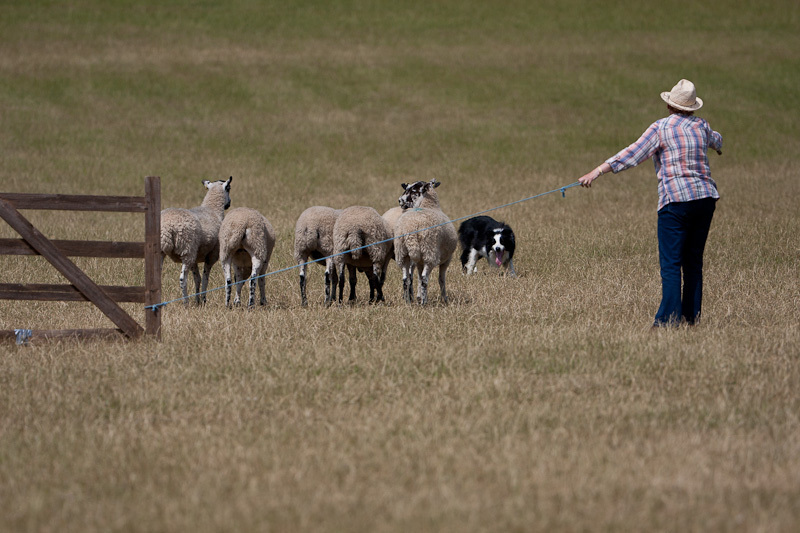 Then the dog has to temporarily separate two sheep from the flock of five ("the shed") before the dog and shepherd take them to the pen where they are corralled ("the pen"). Obviously a lot of the action happens a long way away. 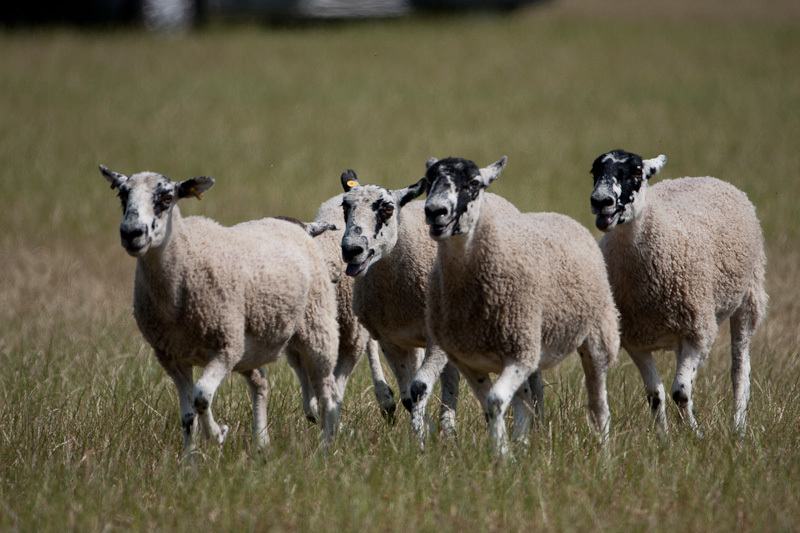 Using Google Maps I estimated that the sheep release point was about 300m from me, and the shepherd's station about 150m. With those sorts of distances to contend with, even 400mm x 1.4 = 560mm focal length isn't going to be enough reach; if I were doing this seriously I'd probably use the Canon EF 800mm f/5.6 L IS USM. 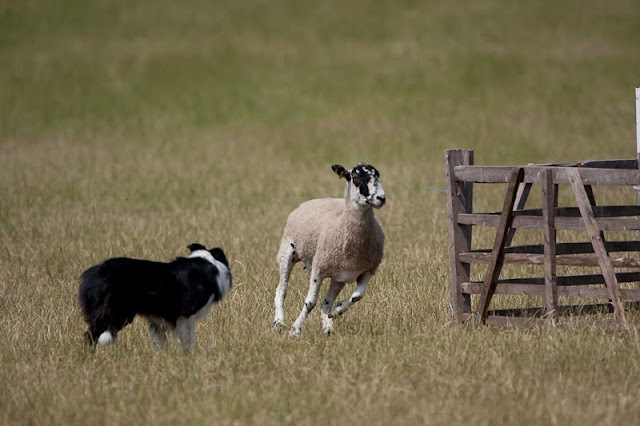 But during the "drive" phase, the dog and sheep would be coming more or less straight towards me - probably quite quickly and erratically - before turning to go through the first pair of drive gates, so hopefully that would present some interesting opportunities. As before, all images below are straight out of the camera - no processing, and no cropping. I have to say that the lens is an absolute joy to use on a monopod. It's perfectly balanced. The zoom action is very light and fast. Holding the lens with my left hand on the zoom ring, so that I could easily change the framing of the picture, was very easy indeed. For example, frames  and  below were taken less than two seconds apart. 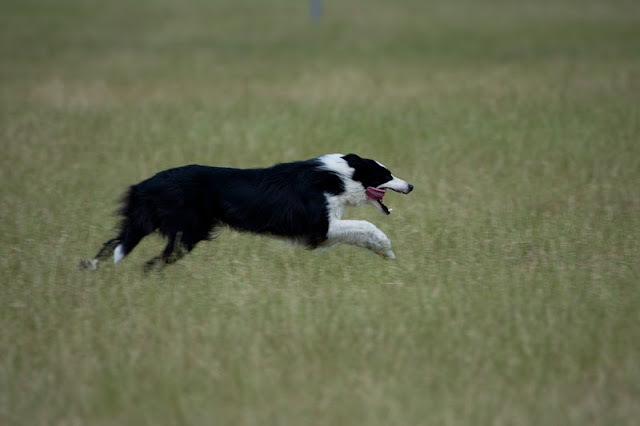 In that time the dog dashed towards me, stopped, turned, and started moving again; I went from maximum zoom to nearly minimum zoom, re-framed, re-acquired focus, and took the shot. It was surprisingly easy. One aspect of the lens which is very easy to overlook is that, when you're using the built-in Extender to increase your zoom range, the lens is no longer a fixed-aperture zoom. It's effectively a sort of 200-560mm f/4-5.6 zoom. This means that you have to be wary when using manual exposure. For example, with constant strong sunlight under clear blue skies, I could just dial in something like 1/2500th at f/4 and leave the camera set like that all day. 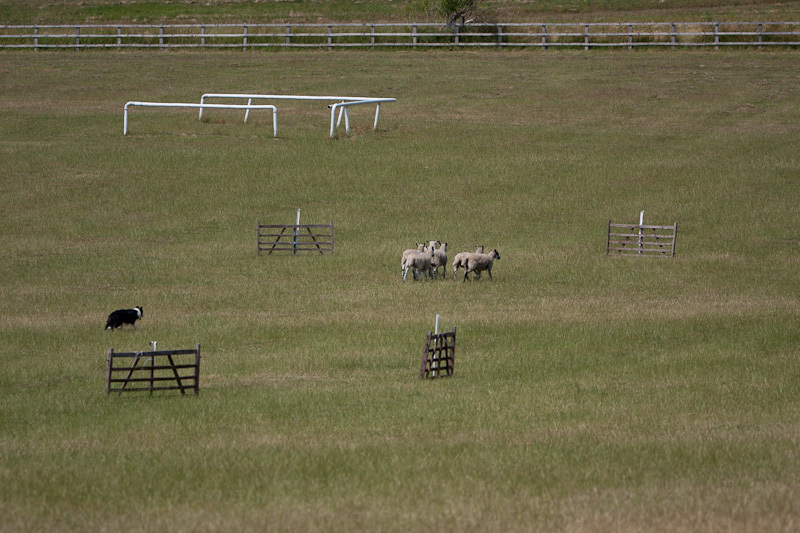 That would avoid any metering issues with white-ish sheep and black-and-white dogs. But as soon as you switch in the Extender, 1/2500th at f/4 becomes 1/2500th at f/5.6 and everything is under-exposed by 1 stop. Of course there are workarounds: use f/5.6 all day, or tweak the shutter speed or EC whenever you use the Extender switch, or use aperture priority and deal with any vagaries of metering. I chose the latter approach. 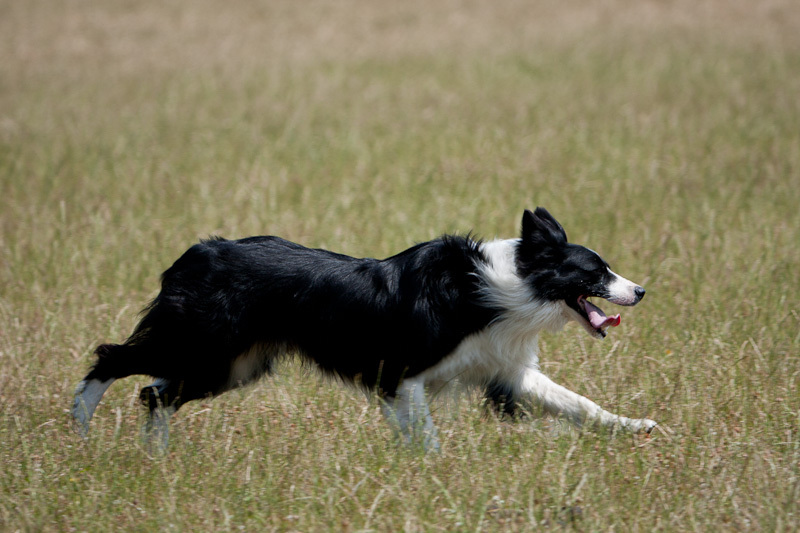 As you'll see from the images below, there's a natural tendency for images of black dogs to be a bit over-exposed, but it's easily dealt with. The AF didn't struggle to keep up at all. As with all of Canon's big white lenses, it seems to be essentially instantaneous. Of course, an air show or motorsport event would tax it a bit more, but I'm confident that it would cope quite easily. 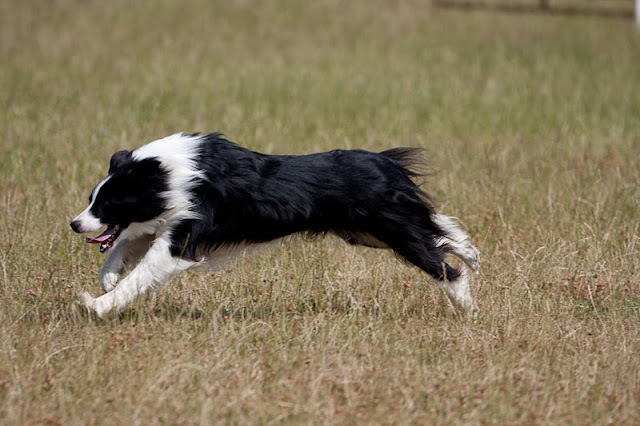 A border collie running flat out is faster than most things you'll see in the sports and wildlife arena, so it's obvious there won't be any problems there. 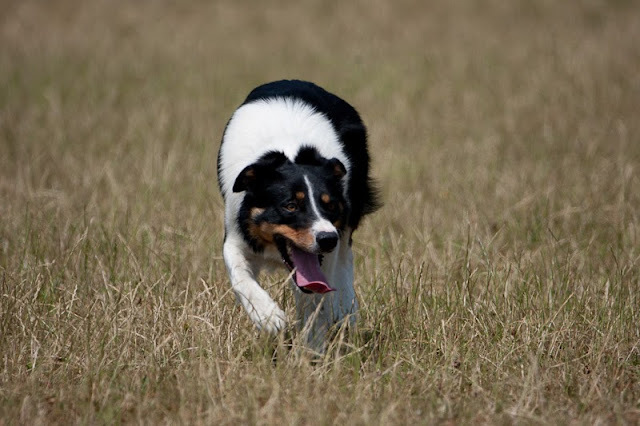 I sometimes had difficulty maintaining the focus lock on a running dog, but that's because I was using my trusty old 40D rather than a camera with a more capable AF system. The difficulty was tracking the target as it moved from one AF point to another, and that's the camera' s job, not the lens's. Overall, I'm very impressed. I certainly couldn't justify £12,000 on a lens for personal use, but if I were a serious wildlife photographer I would definitely be putting it on my Christmas list and trying to persuade Santa that I'd been a good boy. Or I'd be hiring it as and when needed from the UK's #1 lens hire business. The new Canon EF 200-400mm f/4 L IS USM Extender 1.4x has generated a huge amount of interest, not least with its 5-figure price tag. Can it really be that good? I thought it would be a good idea to field test it, to find out. Fortunately there are lots of fields around Maidenhead. 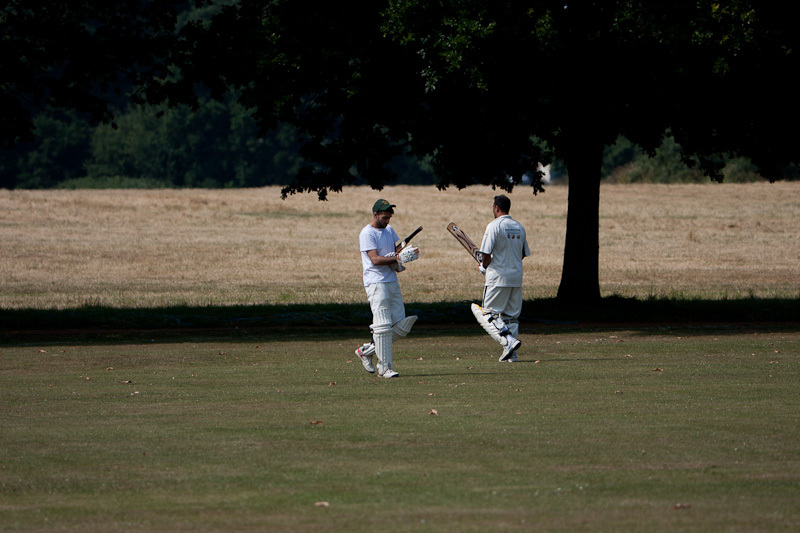 First up was some village cricket. I didn't have tickets for the test match, but this was almost as good. 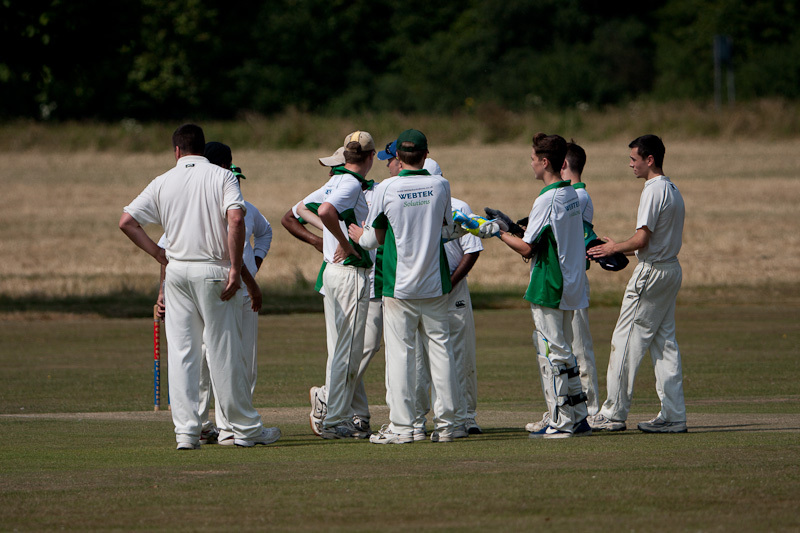 Pinkneys Green 1st XI vs Wraysbury 2nd XI in Division 2 of the Morrant Chiltern Cricket League. And during the tea interval I shot down two bandits as they were lining up their strafing runs on the pavillion. If you're spending £12,000 on a lens you expect it to be good, and physically at least the Canon 200-400 doesn't disappoint. It's reassuringly solid. In an ideal world I think I would have hoped for it to be a bit lighter than the 500mm f/4, whereas it tips the scales slightly heavier; but still, it's good to know that if necessary I could probably beat off a wild animal without damaging it. All the controls are where you'd expect them to be, if you've ever used a big white lens before, and (of course) they all work perfectly. The manual focus ring and the zoom are very smooth. The zoom isn't anywhere near as heavy as I expected it to be, when you think how much glass is being moved around inside. The tripod mount makes an excellent carry handle, and the supplied padded shoulder strap is very comfortable. The unique feature of this lens is of course the built-in extender, and the switch for this is a joy to use. It's perfectly weighted and you can feel the extender softly but silently dropping into place. I was tempted to switch it in and out more than strictly necessary, just for the fun of it. But the user manual warns that you need to be careful to ensure the camera and lens aren't doing anything (shutter button half depressed, autofocus, image stabilization, continuous focus, live view, movie mode, etc.) before throwing the switch. So you need to exercise a modicum of self-restraint, or at least pay attention to what you're doing. At a village cricket match, unlike a test match, you can sit where you like. But since there aren't grandstands, you can't enjoy an elevated viewpoint and you can't watch from directly behind the bowler. So choosing where to sit is non-trivial. Most of the action you'll want to photograph takes place at the wicket at the far end of the ground, where the players are facing you rather than having their backs to you. I tried to find a position where I had the sun more-or-less behind me, a clean background - this can be very important in village cricket - and some shade under the big trees around the boundary of the ground. (It was 31°C in the shade on Saturday.) 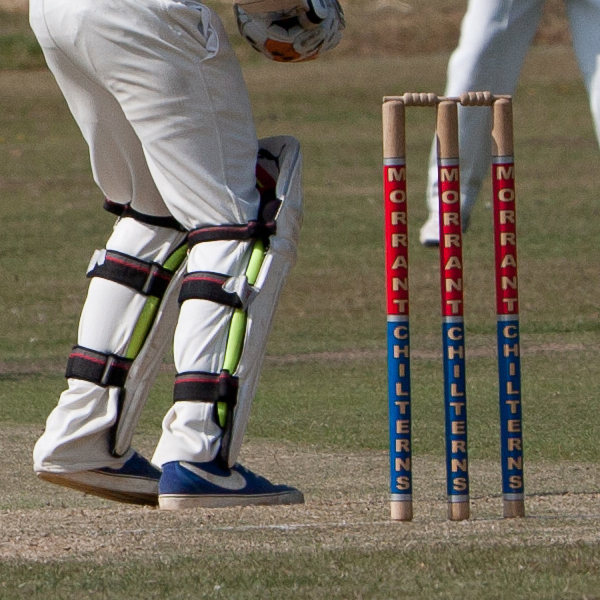 This turned out to be between deep extra cover and long off, assuming there's a right-handed batsman at the far end. 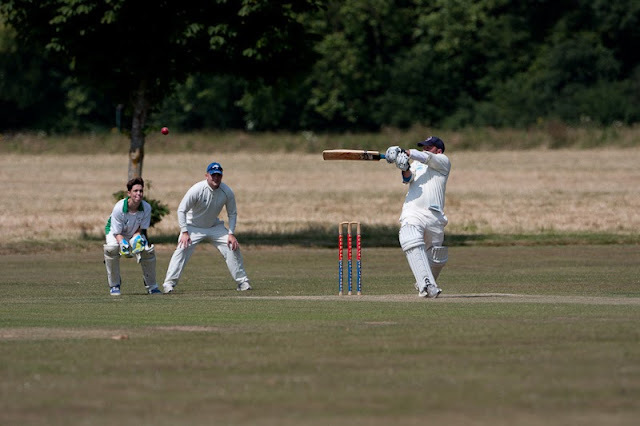 With the help of Google Maps I've calculated that I was about 70m from the far wicket and 50m from the near one. At that sort of range, with a big telephoto, you don't get much depth of field. DOFMaster says that at 400-560mm focal length, f/4-f/5.6, 50-70m range, I should expect the zone of acceptable sharpness to be about 1-2m in front of and behind the subject. Obviously that means that only one player on the pitch is going to be in sharp focus. 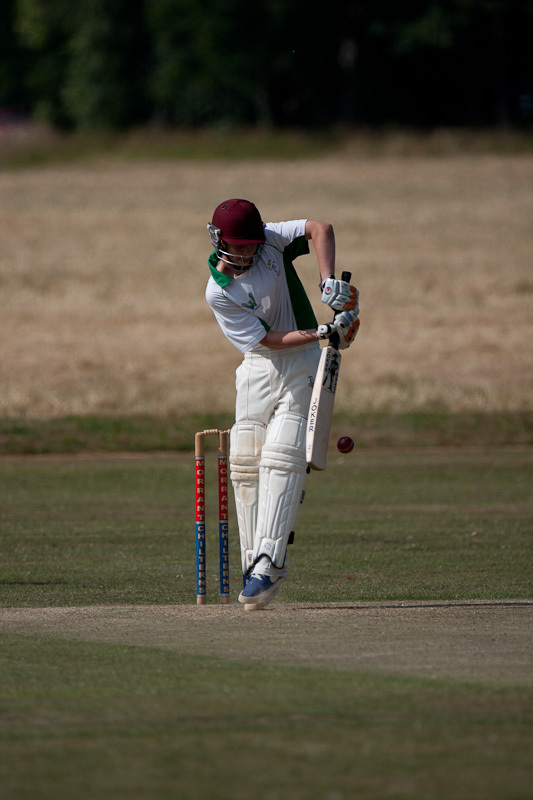 When your subject is the batsman, focussing is easy. 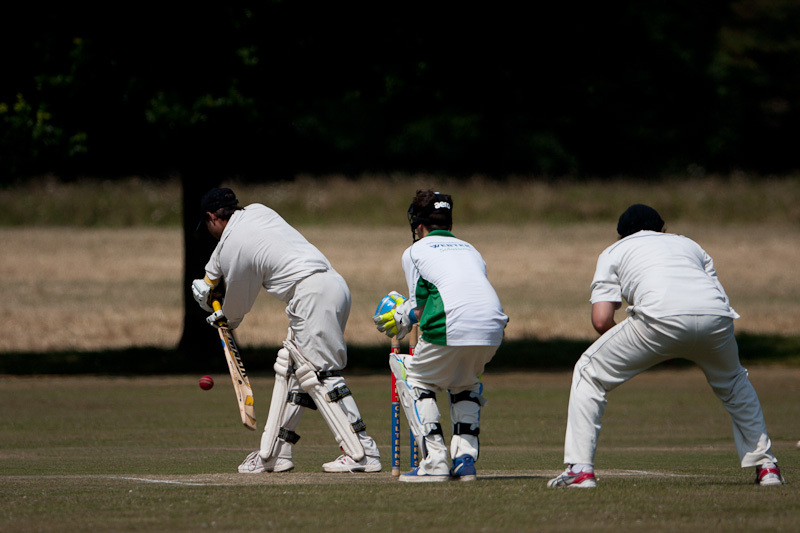 Configure the camera for back-button focussing, acquire focus as the batsman takes guard, job done. He won't move more than 1-2m whilst he's making the stroke, so he'll still be in focus. 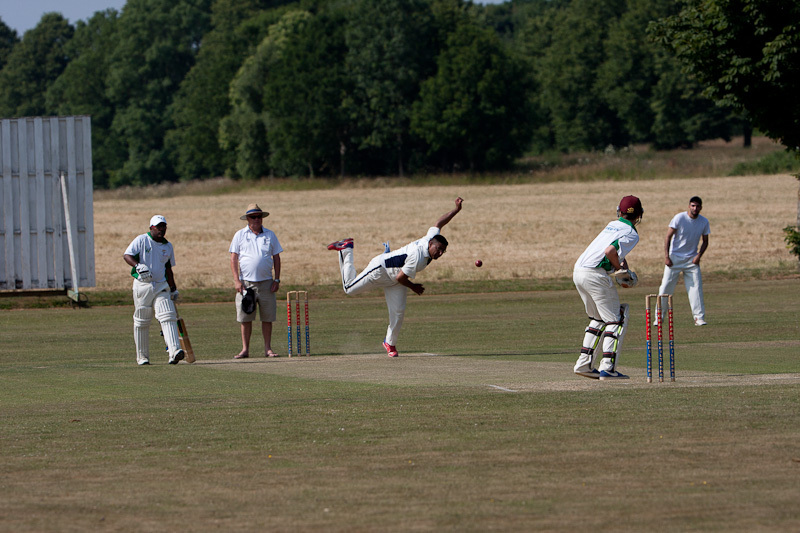 If you want to shoot the bowler, it's not quite so straightforward, though the lens has a nifty feature to help you. It's the focus preset. 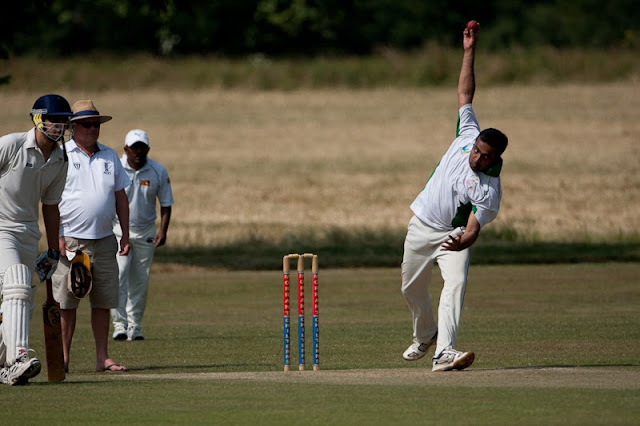 When a new bowler came on to bowl at the far end, I used his first one or two deliveries to focus on him just as he released the ball. When I was satisfied I had a good focus, I used the focus preset to store this. 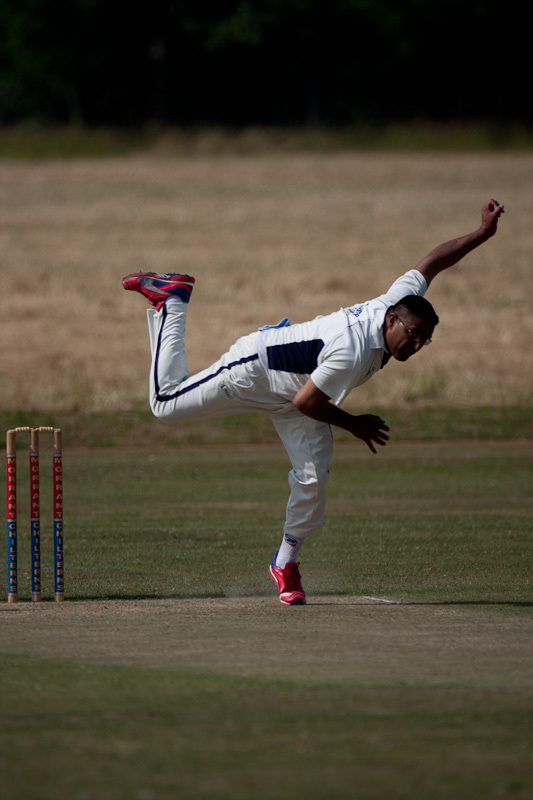 Then I could do whatever I liked with the lens, and whenever I wanted to get a shot of the bowler I just nudged the focus preset ring and it was set up to capture him. I haven't done any processing whatsoever to these photos. That wasn't the point of the exercise. They are exactly as they came out of the camera. But more importantly, I haven't cropped any of them either. That gives you a good feel what what the action looks like at various focal lengths. 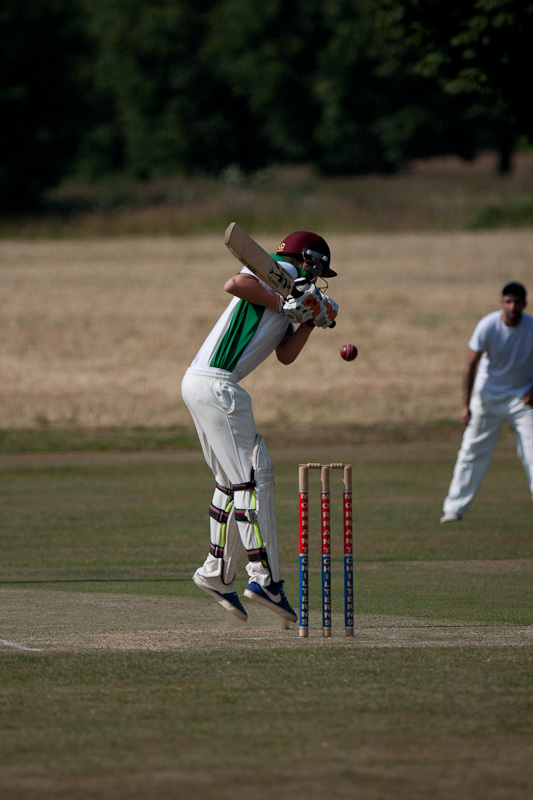 It turned out that 200-560mm was a very suitable focal length range for capturing the action. Typically, 200-300mm gave a good view of the scene with a few players involved; 400-560mm was great for close-ups of individual players. I was using a Canon 40D with a 1.6x crop factor, though. With a full-frame camera (e.g. 5D-series), I wouldn't have been able to get good close-ups of individual players without [a] using another 1.4x Extender or [b] cropping my images a bit. What about optical quality? I hear you ask. Well, there's really nothing much to report. You'd expect a lens like this to be excellent, and it is. I see no trace of distortion or chromatic aberration. The background blur is very pleasing. And I have no complaints whatsoever about the sharpness. The image below is a 100% crop, again with no processing whatsoever (i.e. unsharpened). It's good enough for me. The visitors made 134 all out, and it looked like Pinkneys Green were going to chase down the target quite comfortably, but a middle-order collapse turned it into squeaky-bum time. 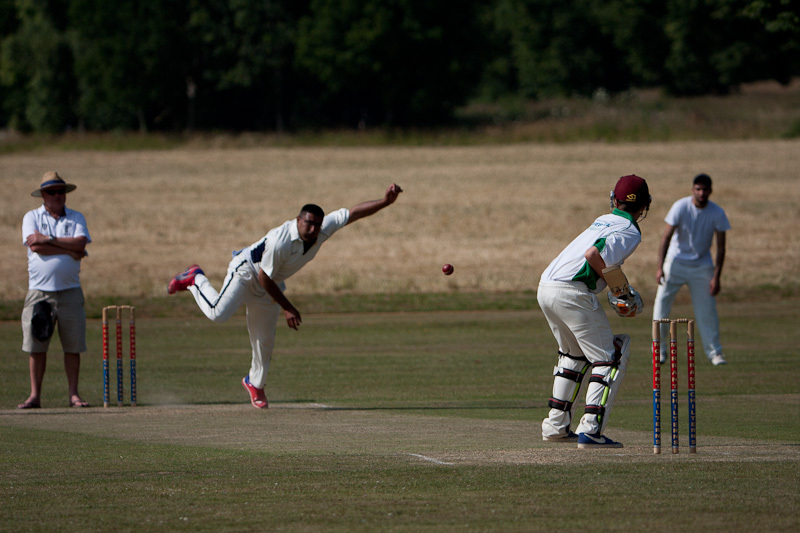 They eventually scraped home with 2 wickets to spare on 135 for 8.